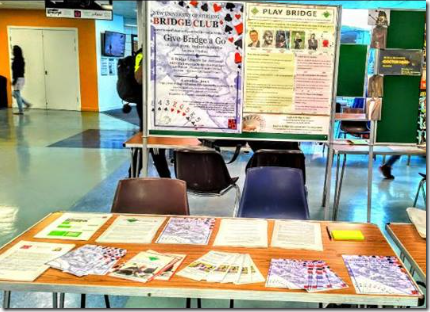 Bridge clubs need to attract new members, for lots of reasons which you will find explained elsewhere on this site. Why though does one club grow while another struggles? There are many factors (some of which are beyond anyone’s control) but one which bears examination is whether a club is an attractive one for a newcomer to join. 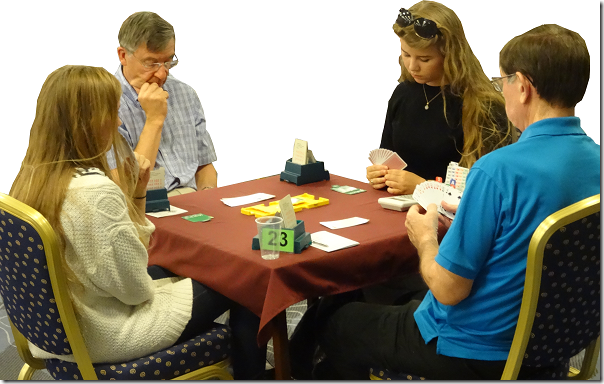 I may be a little biased, but I consider bridge players to be a friendly bunch in general and that most clubs give visitors and newcomers a warm welcome. Nevertheless, it is also true that a bridge club can be a little intimidating. Bridge is an exceptionally absorbing game that demands skill and concentration, and chatter at the table is difficult since it disturbs others and can give away information. This means we need to work hard to create an atmosphere in which every members feels welcome, from novice to expert. How do we do this? Here are a few ideas. First, the role of the director in this is critical. The director sets the tone of a club session. If there is a new player or pair, it goes without saying that the director should make sure they know the names and make them welcome in their announcement just before play begins. Second, it is great if clubs celebrate the achievements of every member rather then just their top players. For example, the EBU’s National Grading Scheme shows not only the percentage achieved by each pair in a session, but also by how much they exceeded or fell short of expectations. You can see this by double-clicking a session in My EBU. This makes it easy for clubs to highlight not only the top scorers, but also those who most exceed their expected result. Third, it is worth making an effort to make club management committees inclusive, seeking a balance between male and female, novice and expert. If the committee is entirely composed of top players, it is not surprising if the club inadvertently gives the impression to newcomers that it is only for bridge experts. 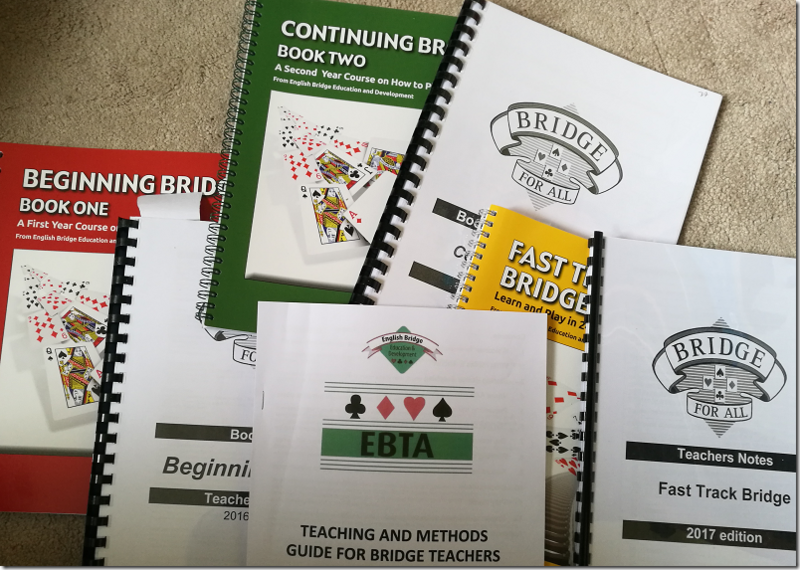 People often learn bridge in middle age or later and have rich work experience; clubs can benefit by bringing them onto the committee and learning from them. At the EBU, we have noticed that it is often the clubs with the highest bridge standards that struggle most to maintain or grow numbers. It is a dilemma because of course we love to see highly skilled players and for members to improve their game. On the other hand, we also want to see more people enjoying and benefiting from bridge which implies clubs with a diversity of playing ability. In the end, we believe it is not only possible but desirable for clubs to provide for members at every level. Giving a warm welcome to novices is one of the secrets of a happy and healthy bridge club. We can all tell the difference between a place that feels welcoming and one that does not, though working out the exact reasons can be a challenge. 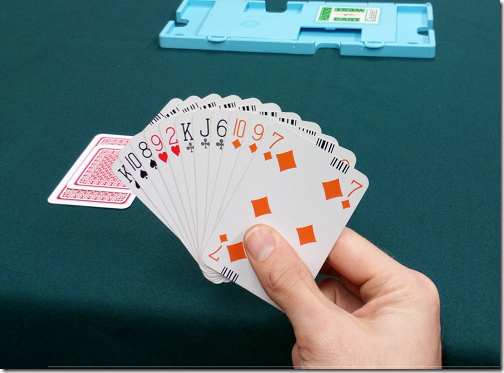 This is important for bridge clubs, and perhaps especially for newcomers who are less likely to put up with a bit of discomfort for the sake of an evening’s bridge. There are many factors which influence the atmosphere of welcome, and this is a subject we will return to, but for this post I want to focus on an issue that every club has to think about: what to do for those who want to play but do not have a partner. Clubs that make it easy for those without partners to play have an obvious advantage over those who do not, when it comes to attracting and keeping members. For example, if a bridge player without a partner moves into an area, they will be looking for clubs that give them an opportunity to play. Equally, if a person’s regular partner is not available, it is great if they can easily get a game. There are several possible approaches. You can do nothing, insist that everyone comes with a partner, but encourage members to contact one another to find a partner if needed. You can use an online matching system. For example, Bridgewebs has a built-in Find a partner system. The person who is looking for a partner makes a request via a web form, and can either post this on the club’s site calendar or have members who have opted in emailed with their partner request. You can appoint a person at the club to be the official partner finder. Members or visitors contact this person with a partner request, and they then either make a match with other requests received, or call/email likely candidates who might be available. You can have a host system. Members volunteer to be on a host rota. The club advertises that anyone can come to a session with or without a partner. If an odd number of people without partners turn up, the host plays with one of them. If an even number (or none) turn up, they play with each other and the host goes home. All these approaches have pros and cons, but if you can make it work, the host system is the best. Here are a few observations. The “do nothing” approach is not ideal, but you can facilitate this a little by getting permission from members to include them on a club directory leaflet with name, telephone number and email address. That at least makes it easy for members to get in touch with each other. You can also suggest that members tell the director if they do not have a partner for an upcoming session. It is a simple thing for the director to announce that person x is seeking a partner for next Tuesday (or whatever) and see who comes forward. Online matching systems seem a good solution, and by all means give it a try, but it has several drawbacks. It is impersonal, and people may be reluctant to advertise to the world that they need a partner. Getting people to use it can be hard. Another problem is that it puts pressure on the person who makes the request to play with whoever responds first. It is understandable that people form preferences about who they like to play with. Online matching systems lack the insight to know that pairing X with Y might not be the best idea. Having a person whose duty it is to find partners has a lot of merit. They are able to judge who is suited to whom, who might be happy playing 5-card majors, who is of a similar standard, who is particularly friendly and tolerant. However this is a demanding role. It needs someone who is mostly available, willing to spend time contacting people, and knowledgeable about the ability and preferences of other members. Time is another factor. It is awkward when someone makes contact the afternoon before the session, for example. The host system on the other hand is fine for last-minute decisions. Those on the host rota know the deal: now and again, they have to be willing to play with whoever shows up. Those who come without a partner also know the deal: they might play with anyone or with the host. There is room for a bit of common sense about who plays with whom if three or four solo players appear. The host system completely removes the requirement to turn up with a partner. That said, the host system also has drawbacks. One is that the host may go home. They may even have left their normal partner sitting at home too, so at worst the club could lose a pair for that session. The thing we hear most often though is that it is difficult to get enough volunteers to fill the host rota. Having a host system is an advantage for everyone in the club. Therefore, one possible solution is to put members automatically on the host rota unless they specifically want to opt out, or are already burdened with other responsibilities like directing and scoring. The big advantage is that the more people you have on the rota, the less often anyone has to do it. There are cases of course where hosting does not work well. The most obvious example is in clubs where people rarely need a partner and the host mostly goes home. The best way to find out if this is the case is to try hosting and log your results. Make sure though that the availability of a host is well advertised on the club website and by word of mouth. Has your club found a great way to find people partners? It is always helpful to share experiences to please comment below or let us know. 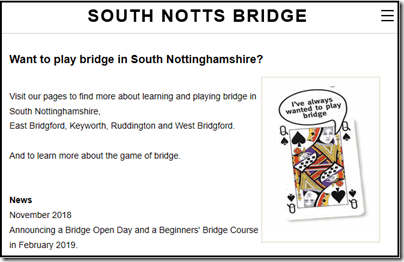 In 2017 four bridge clubs in South Notts – East Bridgford, Keyworth, Phoenix (Ruddington) and West Bridgford – discussed the future of their bridge sessions. Bridge is popular in the area but issues included declining numbers especially at some evening sessions and concern about lack of local provision for newcomers wanting to learn bridge. 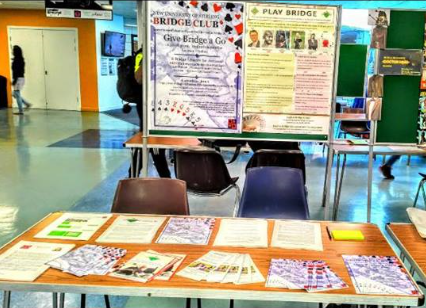 The four clubs decided to set up a joint project to run market and advertise bridge courses, and to establish supervised bridge sessions so that novices would be able to play bridge in a safe environment before migrating to full club sessions. 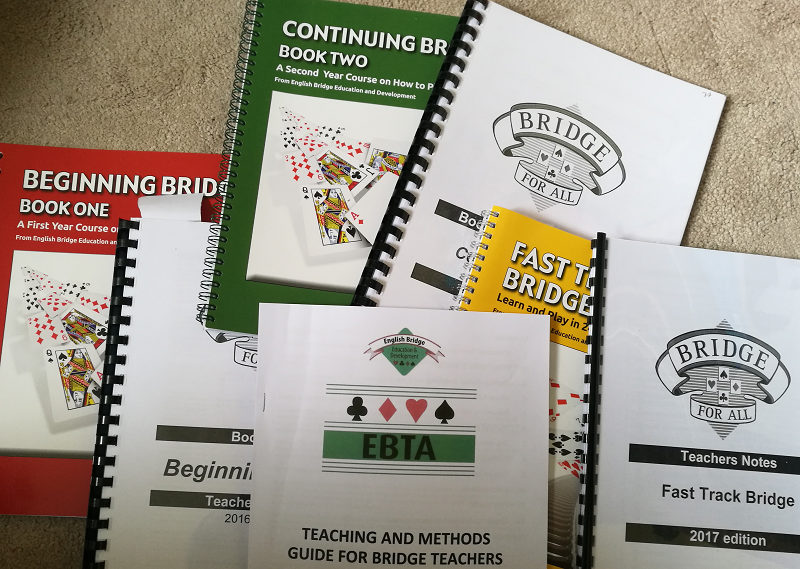 Armed with a £250 grant from their EBU County Association, and drawing inspiration from the Yorkshire membership campaign, the South Notts Bridge initiative kicked off with two open sessions where people could find out more and register for a course. Over 70 people attended, 25 signed up for courses, and two-thirds of those are either now full club members or continuing on courses. This is only the start, and a new course is starting this month. It has been hugely worthwhile, inexpensive in money terms, though requiring considerable effort from existing club members. We have set down here some of the learnings from the South Notts campaign. 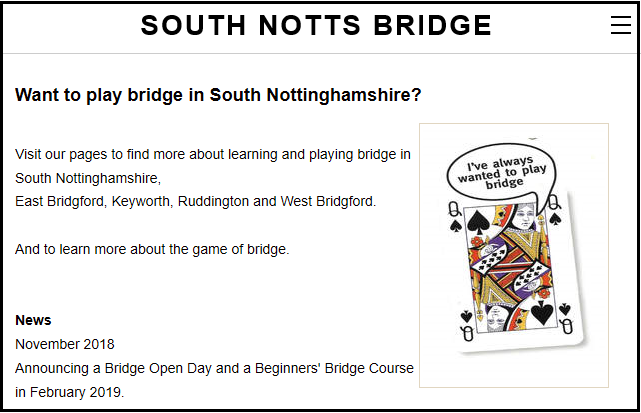 There is also more information on the South Notts Bridge site.